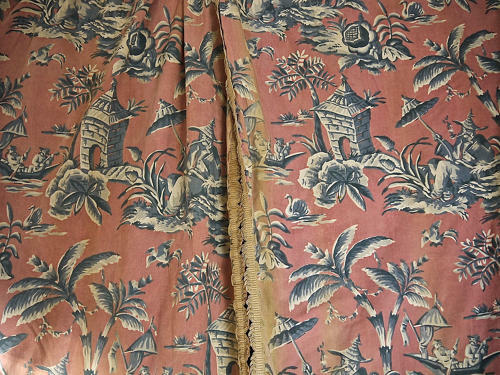 Wonderful pair of early 20th century possibly English cotton curtains printed in shades of grey on a dusty pink ground.Large-scale figure with a parasol under palm trees with flowers and pagodas.With it’s faded dusty pink trim on the edges and bottom of each pair. The curtains are lined in cotton and have their original lead weights. Sun fading to its inside edges but in better condition towards the outside.